Personal Kanban is a unique way of thinking about organizing and planning work and life events. It is the ideal approach to increasing productivity of anything you do. Personal Kanban is gaining significant popularity, because it is simple to use and very easy to adapt. Who can use Personal Kanban? Anyone! Personal Kanban is simple enough to even be used by children! Families use it to share and organize household chores. Students plan homework and prepare for exams. Teachers collaborate with students and conduct interesting lessons. Software developers track bugs and produce better software. Architects gather requirements and prepare designs. 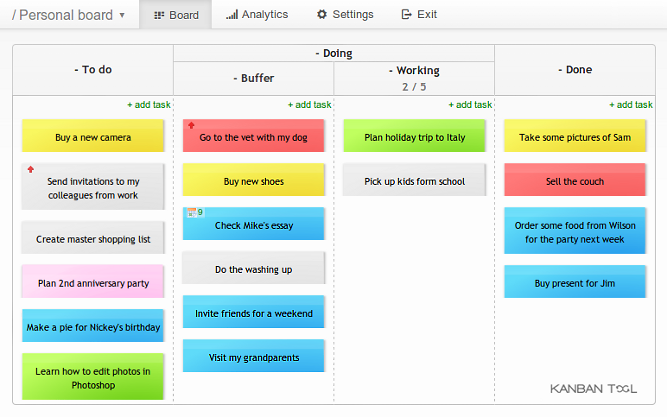 Finally, executives use Kanban boards to organize their business and personal lives. Visualizing work on a board makes organization a piece of cake. Colorful cards with additional visual features (like priorities, due dates and descriptions) help you to focus on the right things at the right time. Analyzing work results with performance metrics supports your self-improvement. Implementing the Kanban method in your everyday life saves valuable time that you can better spend on leisure activities. 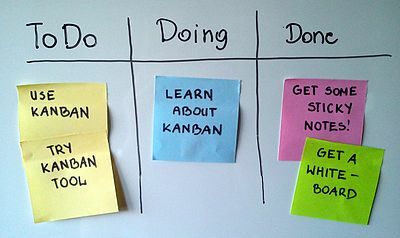 This basic Personal Kanban board consists of just three columns: To Do, Doing, Done. Tasks are always created in the leftmost column and move towards the right. The work is finished when all tasks reach the final column. First of all, you need to identify your workflow. Start with the three simple columns: To Do, Doing, Done. This workflow template suits individual work management best. You can later easily evolve this Kanban board by renaming columns and adding swimlanes, but it's best to start small. Once you have your process mapped out and you've created a Personal Kanban board you can start putting tasks on it. Each activity should be written on a separate sticky note. It's great to use colors to differentiate between task types. Next, you can think about adding additional information such as descriptions, notes, to-do lists, deadlines and people assigned to help with specific tasks. The next thing that needs to be done is to limit the amount of Work in Progress (WIP). This will allow you to focus on the right tasks at the right time. You can't really concentrate on more than two things at any time, can you? It's likely, that applying too high a limit will cause you to lose focus and become less productive. 4. Your Personal Kanban board is ready! Now you can start planning, organizing and working more efficiently. Get a white board and some stickies, write down your tasks, move them and analyze you work. Even easier than that - you can use an online Kanban board, that is accessible from wherever you are and that makes all analysis for you automatically. Once you understand and implement this approach successfully on a personal level, you can apply the same method within your team and your organization for greater transparency and efficiency.